There are many ways to export video out of FCP. We will only focus on 2, which are the most common for this tip, export to QuickTime Movie and export Using QuickTime Conversion. They are both effective ways to get video out of FCP, but it different ways. Basically you will convert and compress your video using QuickTime. This is great if you need to output video in a different format that what you are working in, for a different purpose. For example, if you wanted to post a sample move on a website. However, I recommend that you use Compressor or another compression application for the best results. I rarely use this option for video, however, if you need to export still images this is the setting to use. Under the format pulldown menu in the save dialog box, simply select still image. Unlike the Export QuickTime Movie command, which only exports to a QuickTime movie file, the Export Using QuickTime Conversion command allows you to export to almost any file format QuickTime supports, using any video and audio codec supported by that format. Everything is customizable: image dimensions, frame rate, audio sample rate, video codec, audio codec, and so on. Note: Because QuickTime has extensive support for most codecs and file formats, there may be a lot of options for some formats. While the Export Using QuickTime Conversion command may seem advantageous, there are times when the Export QuickTime Movie command may be better. For example, Export Using QuickTime Conversion always recompresses your media, even if you select the same codec. The Export QuickTime Movie command has an option for not recompressing frames, reducing unnecessary artifacts when exporting to the same video codec. Using this setting you will export a QuickTime movie using the settings from a FCP easy setup. Other options include the ability to save as a reference movie, great for sending to compressor, and the ability to export without any recompression. This is the setting to use when you need to export a full quality video out of FCP. 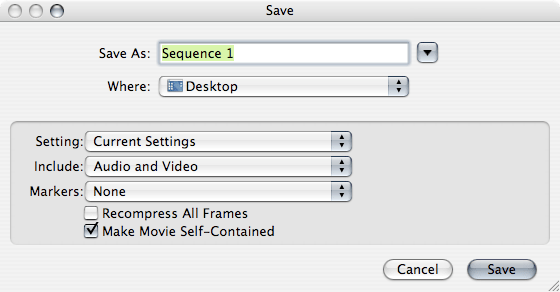 As you can see in the image above, there are 3 options when using the export using QuickTime movie command. Settings, which by default is set to current settings. This allows you to select any FCP easy setup for export. Generally the current settings, is what you want to use, as it will keep you video as it is in the timeline. The include setting lets you select whether to include the audio, video, or both. And the markers selection will let you choose the type of markers that you want to export. If you are exporting for use in DVD Studio Pro via Compressor, you would want to select DVD markers. The check boxes are self explanatory, as recompress all frames means just that. This is a great option, because you can export your video with NO quality loss. The next check box is make movies self-contained. Check this box if you want the move to be able to play by itself. if you leave this box unchecked, it will relay on your media, FCP project info, and your render files. This is however a great option if you want to send your project to Compressor. You don’t have to rewrite all of the media to compress it via Compressor. The Export QuickTime Movie command creates a new QuickTime movie file. Generally, you use the Export to QuickTime movie option to export your Final Cut Pro clip or sequences with their current settings or another video format commonly supported by Final Cut Pro. This command allows you to choose settings based on sequence presets in Final Cut Pro. You can also choose to use the existing settings of the clip or sequence you are exporting, or create customized settings in a custom Sequence Preset Editor. If you are exporting using the existing settings, you can choose whether or not to recompress the frames. If you want to export your movie in a completely different format, such as a QuickTime movie file with a video codec used for the web, you should use the Export Using QuickTime Conversion command instead. If you are exporting with the same settings as your sequence, or if you want to convert to some other video format commonly supported by Final Cut Pro, you should use the Export QuickTime Movie command. And there you have it, how to effectively get a QuickTime movie out of Final Cut Pro.